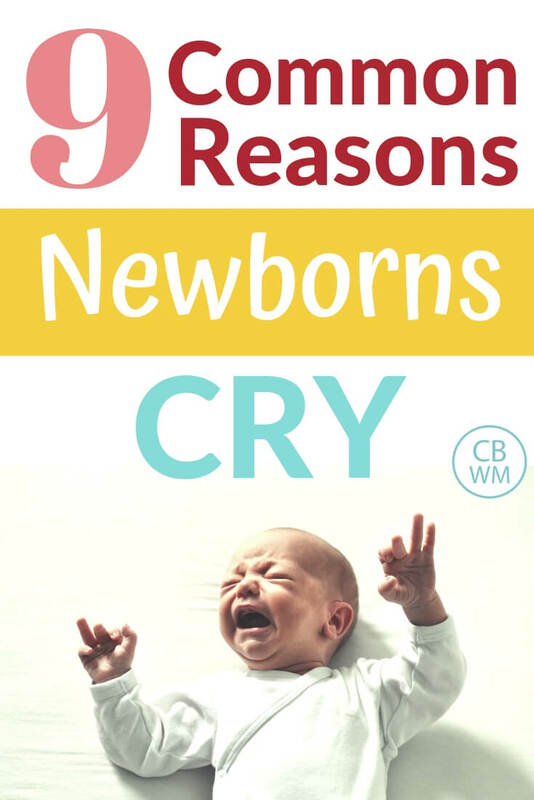 9 reasons newborn babies cry. 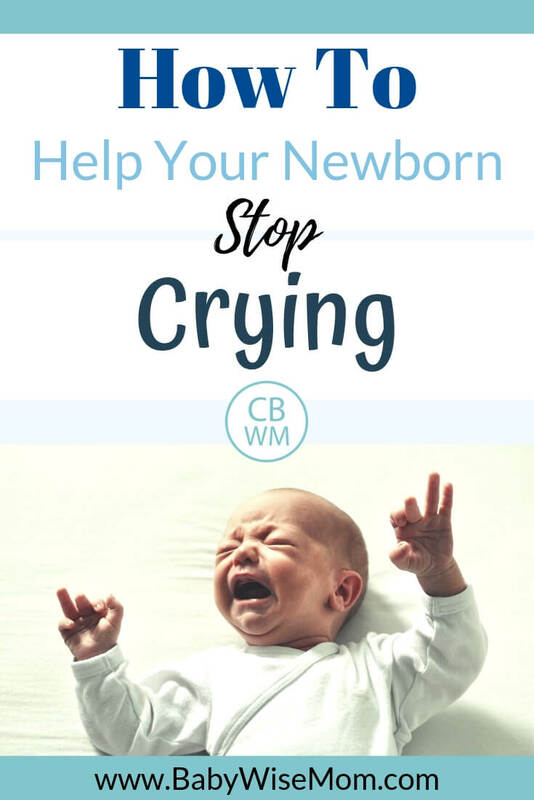 Read about these common reasons for crying and what you can do about it to help your newborn stop crying. A crying baby can be a little paralyzing. You want to do what you can to stop your little one from crying, but you are not sure exactly why the baby is crying so you aren’t sure how to help calm baby down. Hunger: Is it close to time for a feeding? If so, there is a good chance baby is crying out of hunger. Keep in mind that growth spurts happen often during his period. You always want to feed a hungry baby. If baby is hungry and it seems like baby should not be hungry, you feed first and troubleshoot later. Discomfort: Does your baby have a dirty diaper? Most babies in this age range tend to soil their diaper during or soon after a feeding. Your baby could be crying from being bothered by the dirty diaper. Boredom: Has your baby been sitting in the same place or position for too long? While babies in this age range can become easily overstimulated, that doesn’t mean they want to sit in one spot for their entire playtime. Your baby could be crying because she needs a change of scenery. See my favorite baby toys for this age range here. 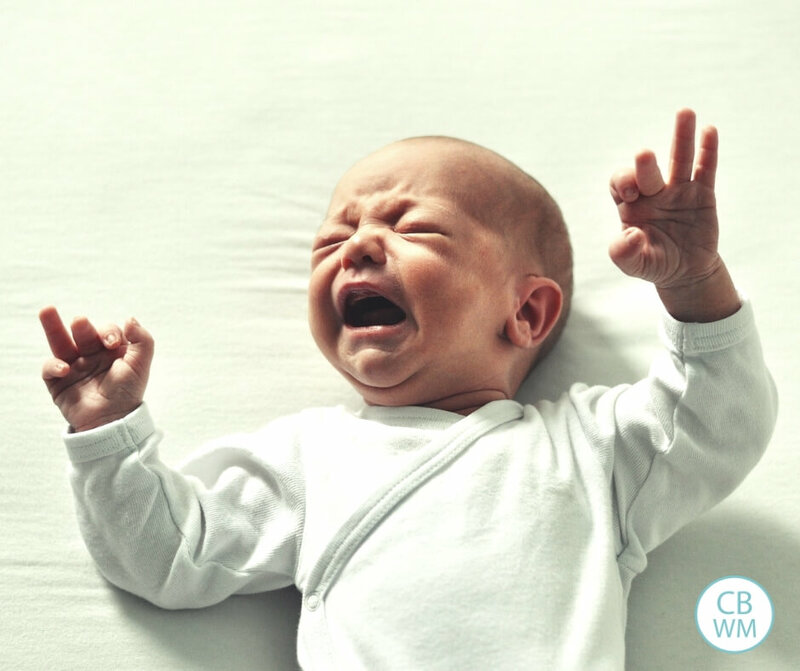 Overtired: If your newborn baby has been awake for a total of 30 minutes or more (including feeding time), she might be crying because she is ready for a nap. You really want to work to get that waketime length down correctly. Putting baby to bed too late will lead to baby crying, whether that be before you start nap time or after. Read my post on Optimal Waketime Length to figure things out. Overstimulated: If baby has had a lot of visitors or if she has been watching her older brother jump around the room, she might be overstimulated. An overstimulated baby will cry. This is common when the schedule is thrown off at all or if you are out and about with baby. This doesn’t mean you can’t ever go out with your baby. This is just a really good clue if your baby is crying and has had a lot of stimulation. To calm an overstimulated baby, you want to remove baby from the action. Read more on how to calm an overstimulated baby here. Gas: If she is making faces and pulling her legs up, she might have gas. Gas can cause a lot of pain and lead to a crying baby. If your baby is crying from gas pain, you will want to help soothe it. Read up on how to help a baby with gas pain here. Reflux: If she is crying and/or spitting up a lot after feeds, she might have reflux. Reflux is uncomfortable for baby and it is common for a reflux baby to cry. If baby arches her back a lot and seems uncomfortable, talk to her doctor to see if it might be reflux. Body Temperature: She might be hot or cold. Either the room could be too hot or cold, or she could be under or overdressed. If your baby is crying, consider if she is overdressed or if the room temperature is good or not. Read up on how to dress baby for sleeping here. Witching Hour: Witching hour is a time when baby just cries. There isn’t anything wrong; it is just a rough time of day. Read about Witching Hour here. What are your thoughts on the “witching hour”? My 3-week-old seems hungry soon after her early evening feeding, staying fussy for an hour, and we don’t know whether she’s hungry or gassy or just a baby.Thanks. My husband and I have implemented the core principles of Babywise since birth with our second child. He is now three weeks old. During the day is getting his waketime mainly by himself in the crib after feedings so not to overstimulate him. He rarely crys going down for his naps, but has recently started to wake early out of naps. I am aware of the 3 week growth spurt, so for the past couple of days, I have been feeding once awake and then reworking the schedule for the rest of the day. The above information is simply to preface my question in regards to crying… For the past couple of nights he has started to cry when going down for bedtime (7:00pm). Last night he cried for quite sometime beginning the moment we laid him down. Originally, we checked for gas, diaper, but knew that he was not hungry. After a while when we would check on him and pat him to comfort, his crying only escalated. My question is this… is it necessary to continually check on the child every 15-20 minutes until they sleep? I should also mention that he is bottle fed, so I know the amount he had at his feeding and we also have a video monitor that allows us to 'see' that nothing is physically wrong with him. Should I let him alone to figure out the skill of sleep or constantly check on him no matter how much he escalates afterwards? Also, do the same techniques apply when they wake early out of a nap and it is not a growth spurt? Do you constantly go in and check on them if they have woken early? Julie, every baby is different. For some, the interference of going in makes it harder for them to sleep. Check out the CIO Bootcamp "http://babywisemom.blogspot.com/search/label/CIO&quot; for more of Valerie's thoughts about that. From what I've read, there are two main sleep books out there: Ferber recommends going in at intervals, Healthy Sleep Habits, Healthy Child, however, recommends not going in at all. If you have a video monitor and can see what is going on then maybe try not going in and maybe your baby will settle. The CIO bootcamp has lots of great ideas for helping to sleep train. Julie,It sounds like you are describing the Ferber method–which I only know things about through others. I haven't read his book. Ferber and other experts recognize that extinction (described by Weissbluth…as Jennifer mentioned…it is no intereference) works the fastest. But it is the hardest.However, it sounds like classic "witching hour" behavior. You can see my newborn summary posts for my experience with the witching hour (see newborn summary blog label). In short, if he needs to be held to fall asleep or needs the swing to fall asleep, that is just fine for that nap. If it is witching hour, then it most likely will not cause problems with other naps. He just needs extra comfort and soothing during this time period. My little one is 5 weeks old & I am trying my hardest to get her on a schedule before I go back to work in 10 days. She will be at daycare 3 days, and w/me & my husband & mother-in-law a combination of the other 4 days. I'm nervous all the good I've done will be undone when my well-intentioned mother-in-law (or daycare) thinks baby should nap in the swing or extends playtime too long & overstimulates her, etc. How can I make sure she's on board? Even I feel bad that sometimes it seems like all we do is feed & change her, before it's time for her to nap again. We do naps in her room, so it's a lot of time away from her & I think my mother-in-law will want to hold her & keep her close & thus confuse & overstimulate her. Help! My almost 6 week old has an extremely hard time going down for naps. We are on our third day of crying it out. I've followed the schedule as much as possible since day 1 but generally rocked him to tired before laying him down weeks 1-4 because I felt he was too young for cio. He fights sleep and his naps so hard with intense crying for 1 .5 hr for every nap. How long will it take for him to fall asleep faster/not cry for his whole nap. I don't know if I can keep doing this. I feel like he is getting so much less sleep since we started this as well. Any thoughts? Is it normal for him to cry that long? No that is very long. Have you read my CIO bootcamp post? And my CIO responsibly post? Those will help you fine tune the process. You really want to focus on waketime length and be sure you have that right.